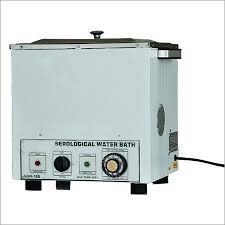 We are offering Serological Water Bath to our clients. The product has a temperature range up to 80°C with accuracy to work on 220-240 volt AC 50 Hz. 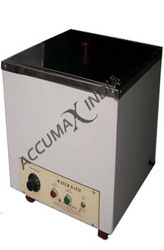 Laboratory equipment serological water bath - temperature range from ambient temperature to 800c. Thermostatic controlled with an accuracy of + 0. 50c. Double walled inside stainless steel and outside mild steel sheet. Bath consists of two pilot lamps, temp, control knob and on/off switch. To work on 220/230 volts a. C. Supplied without stirring arrangement, without racks and thermometer.